Please visit our website to see pricing details. Never pay base fees! I am so grateful for this program finding me! Pros: +The ease of control as the admin-I can see everyone's entries and edit where necessary. +The mobile feature-my foremen can enter their time whenever it is convenient for them and I see their updates immediately. +Producing reports are so easy-it has cut down the sorting through our many Excel sheets to add up our project times by 1000%. We are a small company and did not want to sign up for expensive construction PM programs. This does the job for us without the high expense. +I also use the reports feature to calculate payroll hours...instantly-this has also saved me many hours. +Chat support is instant and they are very helpful and knowledgeable. Cons: -There are very minor details that TS could work on, when I run into them, I contact their customer support via Chat and make my suggestions. An example of one feature I have requested is that they add a line item displaying the date range on their 'Payroll By Account Code' Excel Reports. I can enter this in manually with no issue, it would just be convenient if it were already on the report itself. I already contacted customer support regarding this and she said she would send my request to the engineers of the program. I hope to see this feature updated, if not, I will continue to use this program and manually enter the date range. It is not a show stopper. I would be extremely sad if this program every closed down, can't live without it now. Pros: We have been using Timesheets.com for at least seven years now. I spent a lot of time shopping around and then had a chance to spend some time talking to Joel on the phone who is the owner. He was so helpful and patient with me so I decided to give them a try. I especially wanted an internet based timesheet program where my staff could post hours, and then our accountants could log in and get the hours twice a month to process payroll, without my involvement as the owner. It runs by itself, and the people who need to use it can do their thing without bothering me. What I like most about this service is that: 1. The customer service is some of the best I have ever seen. If I ever have any problems they are always there to help me and I normally don't have to wait at all. You can tell this is a service oriented business and they care about always making sure their customers have any kind of support that they need. 2. Another feature I really appreciate is that you can set the program so that your staff can't sign in earlier than they are supposed to, and that has been an issue at our place from time to time. To summarize I would say that this program is an example of how technology can make your life and business run more smoothly, while having the best service and support at the same time from real, intelligent and helpful people who care. I highly recommend Timesheets.com to anyone who is looking for a good, solid timesheet program to use for their business. Cons: I can't really think if anything offhand, but I also don't use the program myself. Pros: I work at a non-profit and some of our funders require a number of employees to report where they are spending their work time. What's nice about Timesheets.com is that you can create departments in which employees can associate their time, but also projects as well. Employees are expected to dedicated specific amounts of time to certain initiatives each week and Timesheets.com allow employees to copy over hours week by week and adjust from those amounts. My employees love this feature. It saves them time from reinputting info in that stays constant week over week. Cons: I did run into one bug while using the software, which Timesheets.com's tech team is working to resolve right now, but in general, for reporting, you can report on employee, by date range, by signed time and approved time. If signed electronically, the report show that the employee (named) and supervisor (named) electronically signed. But in the instance where an employee is also a supervisor or other employees, the report doesn't name them. Overall: Our onboarding to the product was a great experience. The Timesheets.com team made themselves very available to answer any/all of our questions, and took the time to understand our needs from the system before providing recommended solutions. Support for training new users of the system was great as well. Since I'm the admin, I figured that I would be the person responsible for training new users, but the Timesheets.com team offered to take care of that for me! Pros: Just about everything. We sampled five other timekeeping systems (four of which were higher priced) and nothing compared to Timesheets capabilities and flexibilities. We are a small engineering services company with a distributed work force. We were looking for a web-based tool that was able to track our time against multiple clients, projects, and codes within certain projects. We also wanted an easy to use interface for entering time on phones and tablets. Lastly, we were looking for a tool that could be DCAA compliant when required for certain customers/projects. Timesheets hit every criteria out of the park and then threw in bonus features like a company calendar, flexible reports, etc. Another outstanding feature is the ability to enter billing and pay rates based on specific customers, employees and/or projects. This feature alone has saved us multiple hours each month when running payroll and invoicing customers. The price point and features are unbelievable! It more than pays for itself each month. Although the tool is intuitive to use, they also provide online tutorials and unlimited tech support when needed. Did I mention that the customer support is actually helpful and competent? I have already referred several other small business owners to this platform. Cons: I really have no negatives to highlight. I typically am a relatively harsh reviewer of products. This one doesn't warrant a single negative. 1. It moved us away from manual (home grown Excel spreadsheets) that were prone to errors, typos, and unintentional formula changes. 2. Can be DCAA compliant for government and government contractor customers. 3. 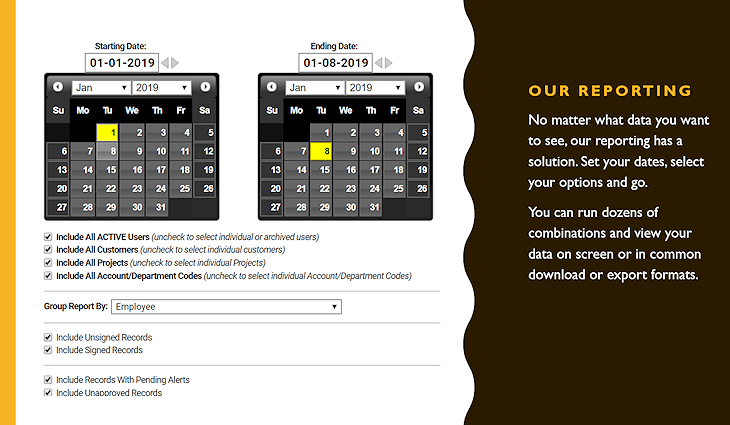 Saved us a ton of time each month when performing payroll and invoicing functions. I am using Timesheets.com for my salon and it's been extremely efficient and easy for me & the team. Pros: I really like how straightforward it was to set up for my employees, and how intuitive and easy it is for my employees to use everyday. It took them very little time to get accustomed to it, I feel confident their hours are being accurately captured, and it's easy for me to monitor and approve hours from wherever I am. I also really appreciate that it has an IP Lock feature; with many online systems that's not available or comes at a premium. Though I have a solid team, it gives me extra peace of mind to know my employees can only clock in and out from the salon computer. I have really appreciated the outstanding customer support I've received, from the time I was just considering using it (they answered all my questions), through setting it up, and even after I started using it, they called multiple times to check in to see if I had any questions or needed any further assistance. That's amazing service, especially considering I only have a few employees, so I'm not a large account for them. They truly care about every single one of their clients having a great experience with their product. Overall: Ability to easily capture employee hours and monitor online. Ease of use, for me as the administrator and for my employees. I saw your comment about clock punches not 'registering'. This simply doesn't occur, so please call us the next time you think this happened. We have a full audit trail and a breadcrumb tracking ability. Usually when employees report clock punches that didn't take, it's user error. Most of the time they just forgot, and we can tell that because there's no audit trail showing they even logged in. Occasionally the audit trail shows the employee logged in but never punched the clock. This is far more rare. In most cases, it's just a simple case of forgetfulness, but we can certainly prove this if we get a chance. Call us the very next time it happens with the name and date and we'll show you exactly what transpired. Great for tracking employees who work in the field! Easy to install and use on smart phones. Pros: I really like the GPS tracking capability on timesheets.com. It helps to verify accuracy of where our guys clock in and out when they are in the field. It was very easy to install on their smart phones and they do not have any problems using it. It is very straight forward. Another great feature is the reports that can be downloaded - good for printing timesheets. Also, customer service is great! I've only worked with rep since we've been using the app (September, 2016), but she is very helpful in answering my questions. If she doesn't know the answer, she always gets back to me after researching it with her technical team. Cons: We would like to use the Customer module of the app for our jobs, but our guys cannot assign a "Customer" to their day through the app. As a work around, we have utilized "Account Codes" and "Notes". The guys will chose the job name using an "Account Code" and in the "Notes", they will indicate the work that was done on that job for the day. Overall: GPS tracking, Accurate time keeping, Ability to look back and refer to jobs worked on. A perfect software to have control of your employees. Pros: Timesheets is a fairly simple software and the things that I like about it is that it allows me to have a general control of my employees, since it has a name established by the administrator previously and thus to have control of when employees work, what days have missed, the hours of arrival and departure, review of the performances of all members. Another thing that I like a lot and is essential in this software is how simple it is, and what is online therefore all this data does not have to be stored in computers and can be consulted from anywhere. Cons: One of the aspects that I do not like very much is that the site totally depends on the honesty of the users and this can sometimes be wrong since employees can modify their times, but for the rest I think the objective of the software is quite successful and that can be quite useful. Overall: This software has helped me to maintain control within my work team, that if it is true that it has its faults in terms of the modification of the times, but the truth is that when you have a work team that you trust and with the accounts, these aspects become irrelevant, as I said before has been quite useful to keep a real follow-up of each employee and according to the data there exposed to be able to take actions either favorable or negative. Overall, Timesheets.com has been a great solution for our company. Pros: I like the fact that I can run any reports I need, based on whichever variables I choose. 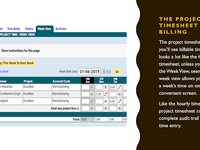 I also like that I can set cost and bill rates for each person, and for each project. That flexibility is important in a consulting environment. Cons: I would really like the ability to copy profiles or create profile templates for setting up new users. It's tedious going through each new user profile to set all the parameters and permissions, when they are the same as many existing users. Thanks for the review, Michael. Actually we do have a simple solution for your problem with new hires! You have a feature enabled even though you're not using it, and hiding it from view will make the project time sheet the default login view. I will contact you offline to show you where to turn it off. That will solve your new hire training problem. Pros: What makes the software so worthy is the simplicity for both the employee & employer to be able to track hours, notes, vacation and etc. One of the features I really like are the reports that are available. One additional bonus to having this software also includes the archived information on each employee for the hours worked while employed with the company. Cons: There is nothing to dislike about this software because I feel that the options available make it so easy to setup a new employee. Overall: Our company has used Timeclock.com since 2011 for both salary and hourly employees. 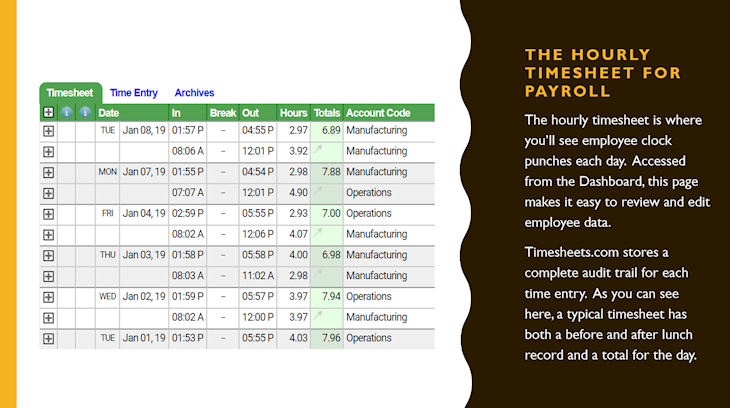 We were able to merge the information/reports with the time clock to our payroll system. Recommendations to other buyers: Try it you will love it ! We appreciate you taking time to review our product after all this time. Reviews definitely seem more relevant today than they might have a few years ago. Thanks again. Each review means a lot to us. Pros: Timesheets is easy to use, it integrates smoothly with QuickBooks; It is inexpensive. It has all the features I need - including mileage and expenses without charging me extra fees unlike other popular and similarly named software. And when I needed mods, they were quick to add them. Their customer service is outstanding! They were with me every step of the way installing and making sure that integration was smooth and seamless. They ran through my first couple of payrolls to ensure everything worked perfectly. They followed up with emails and phone calls as needed to make sure that everything was working smoothly. My team has never had any issue using Timesheets. It is simple to use on any device, from anywhere. Cons: The only thing I would wish for if I could have a wish is maybe a few more reports or that I could customize some reports. That's it. Otherwise I think it's perfect. Overall: I would recommend Timesheets to anyone and everyone. It is the best time tracking software out there and integrates beautifully with QuickBooks. Solved my problems wonderfully and is much cheaper than the other software options out there! We have had a great experience with timesheets.com in the 3 years we have been a customer. Pros: It is very easy to set employees up and add customers. We were able to add special tracking items for our customers to help us track exactly what time was spent where. The reporting feature is easy to use to run reports for different time periods and for different customers. It is easily downloaded to other formats. The website is always available, we have never had any trouble with logging in to access it. The cost is very inexpensive for the functionality you get. Cons: No problems with anything so far. I do have to archive people when we add new people just to stay within our licenses though. Overall: It helps us see how much time we are spending with our customers. Since they are billed for a certain amount of hours per month. It is critical for us to know where our time is going so we can bill appropriately. We were in desperate need of way to track employee time. It needed to affordable & easy to use. Pros: Timesheets is a feature rich solution that has allowed us to effectively manage employee time and reporting. It's very easy to configure and manage. It's great at tracking PTO and expenses. One of the features that we find most valuable is the ability to limit access by IP address. Our employees can only clock in/out when they are physically in our office. Cons: There's not much negative to say about an affordable service that gets the job done with a minimal learning curve. One thing that I feel it lacks is a dedicated mobile app. Timesheets offers a mobile version of their website, but a dedicated mobile app would be a welcomed addition. Overall: Affordable solution that lets us manage employee time effectively, allows us to create useful reports, keeps employees honest with their time cards. Pros: It is easy to use, employee and timesheet setting options are more than enough for our needs, support has been great the two times i had questions, imports data to Quickbooks easily. I also like that we can track all expenses, such as, mileage, we can create and track multiple project time at once and use it from anywhere and upload backup documents. Cons: In the three years we have used this product we have never experienced an issue with functionality or accesability. I guess the way they charge is not ideal. They charge by numberof users but only in groups, so if we have 5 users and need 1 more we would have to pay for 3 more users in the next tier. 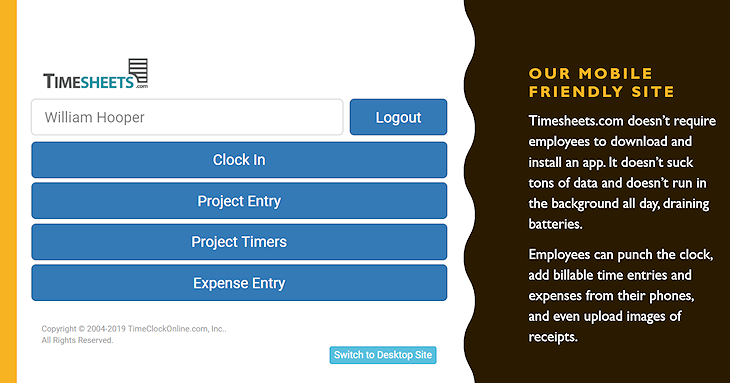 Overall: Timesheets.com made it much easier to track employee and project time and record expenses. Employee Monitoring Sheets used for storing working hours. Pros: -Timesheet Software as well as web-based application. -Data can be exported to other formats. 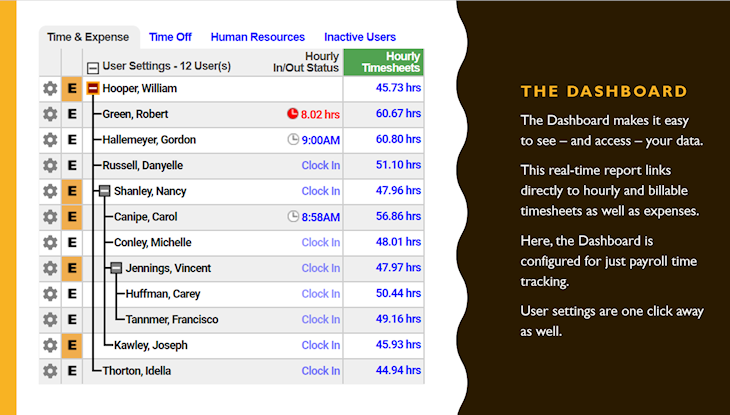 Pros: What I really like best about Timesheets.com is how accessible and user-friendly this software is. I have had no problems using this software for business use. I also really like that the Customer Service is very helpful whenever we have any problems or delays. It's not that common to have Customer Service representatives go out of their way to help and support you when encountering an issue with their software, but the customer service reps at Timesheets.com go way above and beyond to make you feel like an appreciated customer--even after the issue has been addressed and fixed. Cons: There wasn't anything we disliked, and our company decided to try something else based on a recommendation from them. If we have to say something that wasn't helpful. I would have to say that it did not correctly track vacation hours. But it is possible that it offered that option, but we were unable the option. I really just done have anything negative to say about it. I needed an inexpensive solution and their customer service won me over. Pros: I like that my employees are able to submit time off requests and I am notified quickly. It is overall easy to set-up more employees on the account, it does not take a large amount of steps or walk through. Timesheets has been a time friendly way for a small business operator as myself to create a solution. Cons: I would like for Timesheets to integrate a standalone time-clock system to work with their software. I do not like the fact that my employees have to log into a computer to clock in. I would also like for the employees vacation/PTO time to have two separate columns, one that states what they currently have in the bank and one that shows what they have in the bank minus any approved time off requests. It is currently hard to track if the employee is accruing time off correctly compared to their pay-check stub. Pros: From a web browser, the site works great. 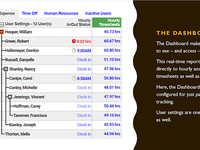 I like the simplistic report generation and the organization of the archived timesheets. Cons: The interface of the website on a mobile device is not ideal. Unrelated to the mobile device, sometimes when reports are ran, it will automatically charge 1.5x the OT rate even when using an account code on a weekend. I originally thought it was due to the formula to start paying OT after a certain accumulation of hours, but I set that to a limit that has never been reached-so I don't understand why it occurs. My work around is to edit the timecard and use the regular rate, so when the program calculates 1.5x, the amount is correct. Intuitive software that doesn't require a lot of instructions for me (or my staff) to use. Pros: I like that there is always help when I do need it. Very problem-solving oriented support team! I have only positive experiences every time I have either a simple or complex question. They take the time to try and understand my business and the underlying goal that I'm trying to accomplish. Cons: The only thing I don't love is that we use the supervisor feature so that our contractors can see their rates per piece - but that leaves me a little vulnerable. Since they are input as supervisors, they can also change the rates on me. I bet we are unique in requiring this feature for non-supervisors, however. Overall: I complete payroll and track employee/contractor volumes by form reviewed. Pros: The flexibility of its Report capabilities is outstanding. I can generate reports quickly and in multiple different ways to suit different projects & my own personal queries. 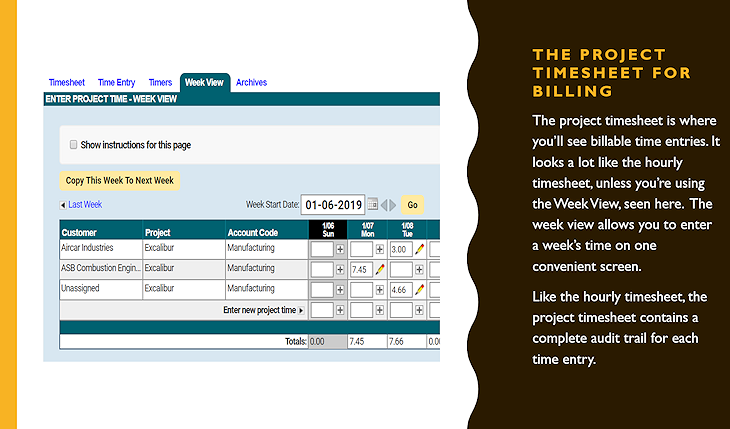 Its easy for my staff to enter their Timesheets as they finish each project or at the end of each day. Being Cloud based it doesn't matter where I am, on what PC or Tablet I'm working from - it just simply all works & its all there ! What more needs to be said ! Cons: Probably due to my own lack of understanding, but in when a Staff member leave & I archieve their data, some of those projects continue to be worked on, but the departed staffer's times aren't included unless you delve deeper to activate their times (which depends on you remembering the time period they worked to & from). Overall: A system that works ! Their chat support is wonderful. They respond quickly and helpful. Pros: The program is intuitive and offers what I need. There are a number of reports available and customizable in so many ways. The clock in and clock out buttons are conveniently placed. The time entry screen is compact and allows space for making long notes. Cons: Setting up an employee is the only thing I have needed assistance with and this is only because I add an employee so rarely. There are lots of options available to cover virtually any setting you could want but it can seem be a little overwhelming. Overall: Allows me to track work done by my remote workers, process paychecks more quickly, and provide historical data on specific projects. Great features & customer service! Pros: The software is very intuitive and user friendly. I didn't have to spend much time training my employees to navigate through all the features. The pricing is very competitive and the customer service representatives is very knowledgable and helpful to answer my question in timely manner! I am very happy to switch my timesheet tracking service to Timesheets.com! Cons: The only thing will be my staffs sometimes mention that it will take a few minutes to log in each morning because it takes some time to start up the PC and lunch the login page, versus if it's a machine they can log in as soon as they enter the office. If there is a way they can log in with their smartphone but strictly limited on office premise only, that will be perfect. Hi Wendy, There's definitely a way to do that! Call us - it's simple and fast. I will email you a the answer as well! There's no software to download or anything. It will just work based on your office IP address. It seems that there is no distinction between "Approving" a time sheet entry and "Allowing" the entry for edit by the employee. If the employee makes an error entry, there should be a way for him to quickly correct it without requiring the supervisor to "allow" it. 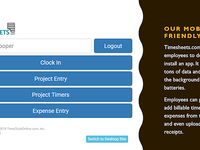 Overall: Overall, we have had a positive experience with TimeSheets.com time tracking solution. There was a learning curve in setting up the different features of the on-line tool and learning how to use them properly. If you are looking for areas for improvement, you might want to consider an interactive (interview) process that enables the company designated administrator to set the various features optimally for the company. I assume for most companies such as ours, the administrator is not necessarily an expert in time tracking systems and could use the interactive tool. Thank you. Pros: I like that it tracks employees time. 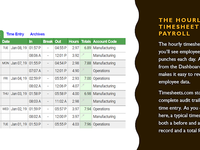 It's a time card that is easy to use, that is not on paper, and not expensive for small businesses. Cons: Being that it really only for time sheets, I say the con is that it is limited in what it can do for small businesses. Overall: I am an accountant for several small businesses. One thing small businesses do to track employee time is to record it using pen and paper. In order for the small businesses to run more like a business, I always suggest they use this system to record employee time. It helps reduce the ability to change time once clocked in and out by the employee but allows the employer the ability to change any discrepancy with times. It is easy to use and helps small businesses watch their employee times. One additional feature it allows is the ability for employees to request off. Most small businesses usually are just word of mouth but this system allows all employee time and requests to be better tracked and recorded. It's not expensive and works just like a time clock without having a time clock in the office. Pros: Ease of use and prompt service. Why the character requirement for this entry? Cons: Mobile option not obvious enough. Again why the character requirement on this entry? I have to admit it took me a minute to understand the criticism in the cons. You complained about a character requirement, which I took to mean that there was such a think on our site you didn't like - be we have no such requirement! But now I understand! 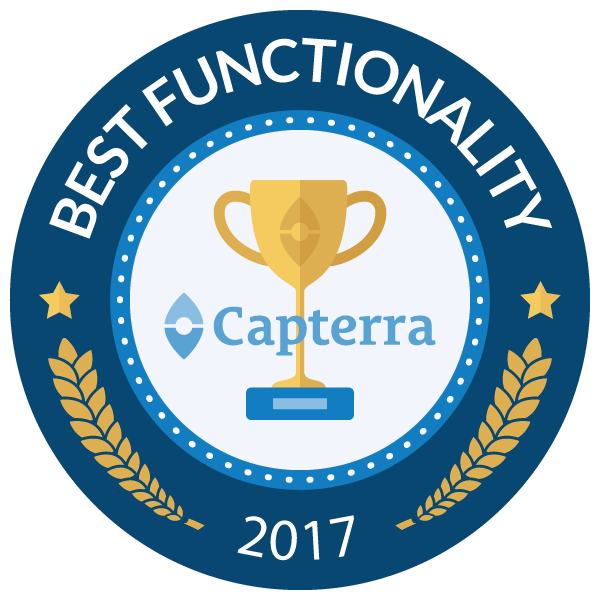 You meant that Capterra requires a minimum number of characters in their review fields. 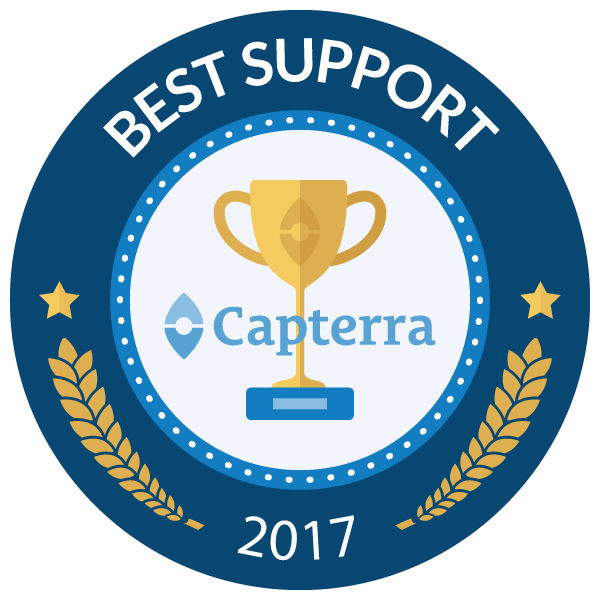 So, if you're reading this review of our service, please know she did not mean we have a character requirement but was instead Capterra did for their review form! We think it's flexible, extremely easy to use, and it was very easy to integrate. Pros: This has been the most powerful tracking service we've incorporated since inception. We found the setup to be quick and easy, while being easy to navigate and providing powerful reporting tools. Payroll and billing has become easier than ever before, while scaling up to the size of our business successfully. Cons: At first, there were concerns that Timesheets.com might not work well because of the size of our company. It would also be the first solution outside of our local network. We're extremely glad we decided to give it a try because it's been better than we could have ever expected. Sometimes we do experience slowdowns, but that's because of connectivity to the service, not the service itself. Outstanding customer service with a product to match! Pros: It so easy to use, even for non-technical people like me! The reports a valuable and in five years we've never encountered a technical problem. The pricing is very reasonable and customer service excellent. Overall: We've been a client for five years and absolutely love this product. We're a Staffing company and have a software program with an online timecard but prefer to use timesheets. At one point, we tried to reduce our costs by using only our online timecard and had so many requests from our clients that after a very short period we went back to timesheets.com. Whenever I've had a question, Joel has always been extremely responsive. THANK YOU! Overall: Our company started using Timesheets.com when some labor laws changed and we needed a better way to track time. From the beginning the program has been easy to set up and easy to use. Our employees like being able to quickly clock-in and clock-out, enter their expenses into the system so that they don't lose receipts, and they can monitor their paid time off balances in real time. I love the reporting functionality - there are so many reports that you can run! And the customer service has been fantastic. I needed help making some company-wide changes to our system and got a personal phone call with details on how to do it! I've recommended Timesheets.com to several other companies and I continue to be pleased and impressed with the program. Pros: This software is easy to navigate and very intuitive. The reason we chose this over other sites was the ability to assign multiple staff codes to an individual employee. Timesheets.com ended up calling us because after we increased the number of staff users and paid the new annual fee, they informed us that we were actually eligible for the non-profit 20% discount which was great! The process to update the new amount owed was quick and easy. Cons: The software overall is a good value for the money spent. As an hourly employee, this is so easy! Pros: I like that every employee is held accountable to clock in and out of work. It is an extremely easy-to-use and functional software that helps the finance department to accurately pay the employees every two weeks. I also like that we can add mileage and review our statements, as well as adding in paid time off, holidays, and sick time. Cons: Everyone is held to a moral standard, so everyone is inputting their own hours. Unfortunately there is no other way of knowing whether or not a person inputted the correct hours. Pros: The online tracking, reporting and upload availability to our payroll system makes processing payroll more accurately. Cons: Trying to uncover or find some functions that aren't utilized often is time consuming - BUT - their customer support is terrific!! Overall: Our company is able to clock in/out nearly 100 employees throughout several states, including lunch breaks, and breaks in time due to AM/PM shifts with ease and accuracy. The implementation to import it to our payroll system due to the seemingly endless codes we have to apply to all of our staff and location, allows us to track and budget each location we have. Overall: Your program has removed those petty HR employee issues of absentee, late and/or vacation/days off issues. This system eliminates that opportunity for an employee to take advantage of the employer. Most important when it comes to pay period reporting, it provides the printout very easily for my bookkeeper to pay. The Timeclock Online support over the years has been very courteous and patient with me. As small business owners we have enough on our plate, and your support allows me to focus on what I do best. Great job and keep up the good work, you've been a big help. Customer support was easy to contact and recovery solution. I saw your review. I wanted to let you know that we absolutely have a tool to input holiday time for everyone at once. You do NOT need to enter holiday hours one employee at a time. Please see the Global Manual Entry link in the TOOLS section of our left menu. Please call us if you need help, but that form is all you need! Pros: Internet based so no problems with a station based program. As long as you have internet your employees can clock in/out and submit expenses. Easy for employees to understand, not time consuming training. Cons: Expenses should be uploadable in pdf format. Overall: We only use this for hourly timekeeping and expense reporting so I can't speak to PTO, etc. I was worried that the attention I received before I signed would disappear once I had paid for the subscription but I actually have received excellent attention from Timesheets.com. I have had no technical problems at all on training issues. Any time I requested help for an issue it was addressed immediately. I have only attempted to contact the company by email so I don't know how calling in works. My emails have been addressed within a couple of hours and in some cases they have called me when the solution was more complicated than an email response allowed. 1) The location lock is by router not by station so employees can use any computer in the office to clock in and out. I understand why this is but still disappointed. 2) The expense reporting section only accepts .jpeg uploads (as opposed to .pdf). This is solved by having employees use their phones to report expenses. For my companies uses this is a wonderful product. Recommendations to other buyers: Great cost! 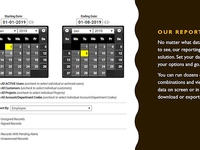 Our previous timekeeping/expense/PTO tracking program was $65/person/month. Pros: Never any glitches with the software. It is easy for all of my employees to use. There is a mobile app which all of my providers use. Adding new employees is easy. Cons: When you archive an employee who has left and you want to look at hours from previous years you have to reactivate them. Than you have to put their end date in again when you are finished with your reports. It would be nice to just be able to check a box to run the report and than uncheck them when the report is finished. Pros: The software is VERY easy to use. When I have questions on how to create a report or change something, the chat support is SUPER fast and very helpful. I have NEVER had anyone there say they didn't know how to fix something. I even has a tech call me, while on chat, to expedite the edit to my account. Really remarkable how fast and how helpful they are all. My experience has been outstanding. Cons: Nothing negative to say really. There are some things that don't really come easy with logic, but the support helps smooth those little things over very easily. Overall: Time tracking for projects and clients for my team. I have been using this software for over 5 years. We use it almost every day. Pros: It is comprehensive, flexible and easy to use. Our contractors use this software to their time. The ability to do reports a number of different ways has allowed us to add a level of transparency that our clients really like. Cons: Connection to quickbooks should be spelled out in a better way. It would be nice to have the ability to have clients have an area to sign in to so that they can track project totals. Overall: This software gives us an organizational advantage over other firms. Pros: It's really simple for first time users and people that haven't used a time clock before. I love the interface and how easy it is for employees to punch in and out. Cons: There are a few functions of the software that haven't been intuitive to me in the user process. Running custom reports, entering in employee schedules, setting up holidays, for example. However, I've always contacted customer support and they help me through my question within minutes. The answer is generally quite simple, but if I hadn't contacted support I wouldn't have gotten to the answer nearly as fast. Overall: My employees are able to very simply clock in and out, but I can do almost anything with the information their time punches provide. Many reports to run. Timesheets.com can be as simple or as complex as you want it to be as the administrator/payroll. Overall, I really like the software and have no major issues with it. Pros: It has been easy to use for everyone. I have zero complaints from the employees about their use of the software. Cons: I do not like that, I, as one of the administrators, cannot edit PTO once it has been entered, like you can regular clock in/clock outs. If I need to adjust the PTO time or I've entered the wrong date, I can not edit it. I have to completely delete the entry and start over. I really wish that this could be changed and become an option to do so. Timesheets.com has changed the way we view our time. We are able to learn as we grow our business. Pros: The custom reports are really helpful for us to determine manpower costing for projects. We are able to gauge where we are spending our time and where we should be spending our time. Further, we are able to analyze our time spent on individual customers as well as projects. Cons: It took me longer than I would have liked to get my feet under me, so-to-speak. I had multiple offers from the timesheets.com support team, but thought I could learn it on my own. I learned more in one phone call with a support person than I could have learned on my own for months. I wish I had made that call sooner. I have been discovering all the features, and it's easy of use. Customer support is amazing. Pros: It is easy, the functionality is real. Customer support is incredibly kind and useful. My personal experience is mostly with few people, and he always have helped me in my needs, as the other agents as well. Cons: Due to the nature of my business, we had to figure out how to set up notes. And the way we found out to do it is a little difficult for the employees. Overall: Total accurate control of the employee's hours. Flexibility to make changes and adjustments. Pros: I like the flexibility my employees have. Not everyone has an office, or even reports to the building each day. The ability to log in from the job site is paramount for me. Cons: I had a little trouble in the beginning with setting up account codes. As the administrator, having access to all usernames would be helpful. I have seasonal employees who don't work frequently enough to remember them. Overall: I love this product. I find it a great value for the money. I have had two minor issues today. I clicked on the chat link and was immediately connected with a very knowledgeable associate. I was walked through the process very quickly. On the second occasion, the chat was disconnected. The representative I was chatting with immediately called me to finish addressing my issues. Recommendations to other buyers: I have recommended this software to several people. It has done exactly what I wanted it to. Pros: What I like most is if I have a question on a new implementation of processes I can either go to chat or give a call and they have an answer very quickly. Pros: TimeSheets lets us to manage the Work of each and every employee with Time. The easy user interface and features are really amazing and helped a lot to arrange the further activities. As a maintenance engineering company, can track and keep records of employees and their projects involved. And also can generate invoices and payrolls. Their customer service is really personally helpful when need support about the service. Cons: Nothing to tell any bad, cause this has many features that match. But need more resources to learn how to work with this. Need more offline support to your service. Overall: The best software solution for small businesses and even for large comapanies (if suitable) for manage payrolls and invoicing need, specially with Time and GPS records. Pros: time/project tracking - for cost purposes into accounting. Faster and info in real time. Great expense tracking function. Our guys are all over Ontario and I can keep track of expenses in a timely manner. Cons: Wish there was a time function on the project timers (like the hourly) When our operators clock in it's hard to see where they were first, if it showed the clock in/out would be easier to track. Geo located not of any assistance since it doesn't track each stop during the day. Our operators travel quite a bit and visit many sites in a day. Overall: none really - I was asked to take it from a vendor. Timesheets.com has made our time management much easier! Pros: We love the ease of using the system. Our employees do not really need any training - they just watch the tutorials, and they are good to go. The reports are easy to run. We used to compile our excel timesheets manually, and also had to compile reports manually. Cons: I wish that timesheets kept the data for longer than one year. Also, some employees have reported that capturing receipts through their phones is cumbersome. Pros: The program is fairly straightforward and very easy to use once the Employees are activated. I really like the ability to lock down the IP address for logins. Cons: I have yet to find something that I do not like. Overall: Every time I have called Timesheets, the customer service has been outstanding! The representatives are well spoken, the connection is great without static and background noise, and their instructions are clear. They have been exceedingly patient and courteous. Pros: It's nice when you have employees that work from home and can still clock in and out. It's also nice to not have hand written time sheets to try to decipher . Cons: You can change your own times, which is nice in a way, but it can easily be abused. Other than that everything else is pretty nice! Hi Emily, Thank you for the feedback. I wanted to mention after reading your review that you while employees are defaulted to being allowed to change their own times, this is by design. This way, all requests are employee-generated (better for audits) and must be approved by a supervisor. You can also disable the ability entirely, but we recommend leaving it on (with supervisor approval) so your employees can enter their own time change requests. You get a full audit trail that way. Please contact us so we can review your settings options with you. Pros: I like the ability to allow for individual employees to have more than one job position. I looked around for different online timesheet software that allowed for the capability to do so, and there were not that many. The price is fair and the layout of the website is easy to read. Cons: It would be nice to have a timesheets app for iPhone and Android available as well in addition to the mobile site available.